Get ready to save hours of time while everyone starts calling you an "event planning genius". Right now you can book the show that's been captivating the executives of Canada's top businesses for the last 15 years... with just one call. 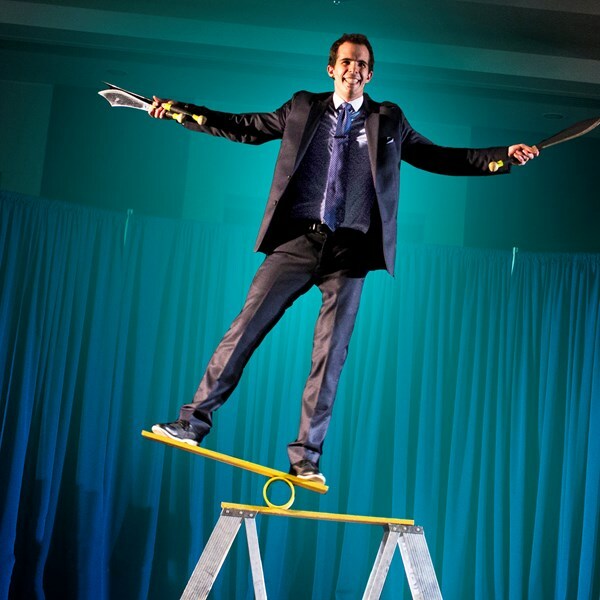 Your guests will roar with laughter during Sam's highly-interactive magic show! Even your most conservative guests will love his squeaky-clean comedy. Trusted by: American Standard, Air Miles, AMEC Nuclear, BDO, Direct Energy, Economical Insurance, ESSO - Imperial Oil, Manulife, OLG Casinos, Red Cross, Scotiabank, Shell, Suncor, and many more! Please note Hilarious Magician Sam Pearce will also travel to Oakwood, Downsview, North York, Weston, Willowdale, Etobicoke, Fisherville, Thornhill, Concord, Scarborough, Woodbridge, Maple, Richmond Hill, Markham, Mississauga, Kleinburg, Locust Hill, Brampton, Gormley, Springbrook, Whitevale, King City, Oakville, Pickering, Ajax, Nobleton, Stouffville, Bolton, Brougham, Hornby.